Abstract. The dicarbonyls glyoxal and methylglyoxal have been measured with 2,4-dinitrophenylhydrazine (2,4-DNPH) cartridges and high-performance liquid chromatography (HPLC), optimised for dicarbonyl detection, in clean marine air over the temperate Southern Hemisphere (SH) oceans. Measurements of a range of dicarbonyl precursors (volatile organic compounds, VOCs) were made in parallel. These are the first in situ measurements of glyoxal and methylglyoxal over the remote temperate oceans. Six 24 h samples were collected in summer (February–March) over the Chatham Rise in the south-west Pacific Ocean during the Surface Ocean Aerosol Production (SOAP) voyage in 2012, while 34 24 h samples were collected at Cape Grim Baseline Air Pollution Station in the late winter (August–September) of 2011. Average glyoxal mixing ratios in clean marine air were 7 ppt at Cape Grim and 23 ppt over Chatham Rise. 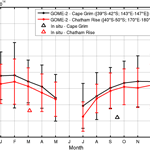 Average methylglyoxal mixing ratios in clean marine air were 28 ppt at Cape Grim and 10 ppt over Chatham Rise. The mixing ratios of glyoxal at Cape Grim are the lowest observed over the remote oceans, while mixing ratios over Chatham Rise are in good agreement with other temperate and tropical observations, including concurrent Multi-Axis Differential Optical Absorption Spectroscopy (MAX-DOAS) observations. Methylglyoxal mixing ratios at both sites are comparable to the only other marine methylglyoxal observations available over the tropical Northern Hemisphere (NH) ocean. 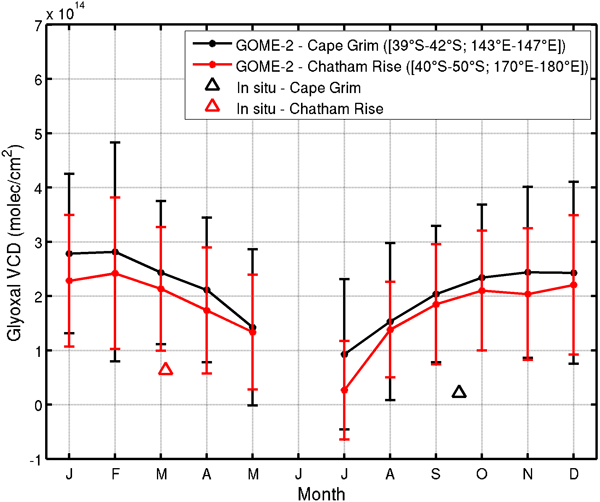 Ratios of glyoxal : methylglyoxal > 1 over Chatham Rise but < 1 at Cape Grim suggest that a different formation and/or loss processes or rates dominate at each site. Dicarbonyl precursor VOCs, including isoprene and monoterpenes, are used to calculate an upper-estimate yield of glyoxal and methylglyoxal in the remote marine boundary layer and explain at most 1–3 ppt of dicarbonyls observed, corresponding to 10% and 17% of the observed glyoxal and 29 and 10% of the methylglyoxal at Chatham Rise and Cape Grim, respectively, highlighting a significant but as yet unknown production mechanism. Surface-level glyoxal observations from both sites were converted to vertical columns and compared to average vertical column densities (VCDs) from GOME-2 satellite retrievals. Both satellite columns and in situ observations are higher in summer than winter; however, satellite vertical column densities exceeded the surface observations by more than 1.5 × 1014 molecules cm−2 at both sites. This discrepancy may be due to the incorrect assumption that all glyoxal observed by satellite is within the boundary layer, or it may be due to challenges retrieving low VCDs of glyoxal over the oceans due to interferences by liquid water absorption or the use of an inappropriate normalisation reference value in the retrieval algorithm. This study provides much-needed data to verify the presence of these short-lived gases over the remote ocean and provide further evidence of an as yet unidentified source of both glyoxal and also methylglyoxal over the remote oceans. How to cite: Lawson, S. J., Selleck, P. W., Galbally, I. E., Keywood, M. D., Harvey, M. J., Lerot, C., Helmig, D., and Ristovski, Z.: Seasonal in situ observations of glyoxal and methylglyoxal over the temperate oceans of the Southern Hemisphere, Atmos. Chem. Phys., 15, 223-240, https://doi.org/10.5194/acp-15-223-2015, 2015. Glyoxal and methylglyoxal are short-lived organic trace gases and important precursors of secondary organic aerosol. Measurements over oceans are sparse. We present the first in situ glyoxal and methylglyoxal observations over remote temperate oceans, alongside observations of precursor gases. Precursor gases cannot explain observed mixing ratios, highlighting an unknown source. We show a large discrepancy between calculated vertical column densities of glyoxal and those retrieved by satellite.